This Remembrance Day, we take a moment to salute those who were involved in the war effort during the Second World War and joined the fledgling Canadian Opera Company as singers in its nascent years. Prior to becoming one of the original members of the Canadian Opera Company, Glenn Gardiner was a pilot who joined the RCAF in 1940, flying 23 missions until May 6, 1942, when his plane was shot down over Belgium. He was captured and transported to Stalag Luft III, site of the now-famous Great Escape. Gardiner acted as a lookout for the diggers, but was not one of the 79 who attempted escape because he suffered from claustrophobia. Gardiner spent exactly three years as a POW. After the war, Gardiner returned to Toronto to study at the Toronto Conservatory of Music (later the Royal Conservatory), after which he met teacher Ernesto Vinci and the COC’s first General Director Herman Gieger-Torel who plunged him into the world of opera. 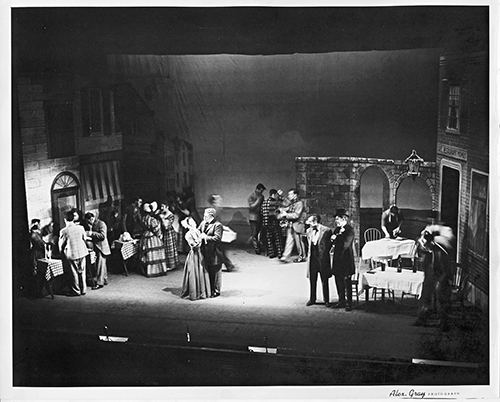 For the COC, Gardiner sang in all the productions of the company’s first two years Rigoletto, Don Giovanni and La Bohème (1950), and Le nozze di Figaro, Madama Butterfly and Faust (1951). 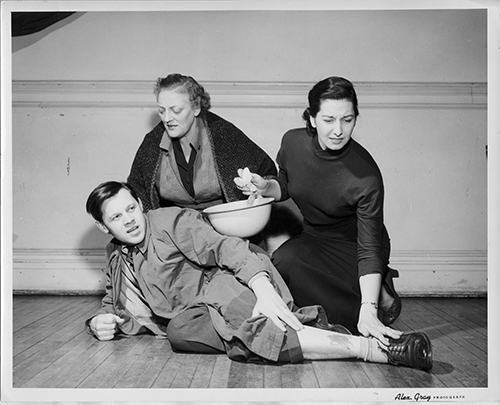 He also sang the role of John Sorel in Gian-Carlo Menotti’s The Consul in 1953 and 1954 among many other roles. During the war, bass-baritone Andrew MacMillan performed for the troops as a member of the Canadian Army Show. While he had already appeared extensively in operettas and musicals in Montreal during the 1930s, it wasn’t until the war was over that he began studying in earnest at the Royal Conservatory under Ernesto Vinci. 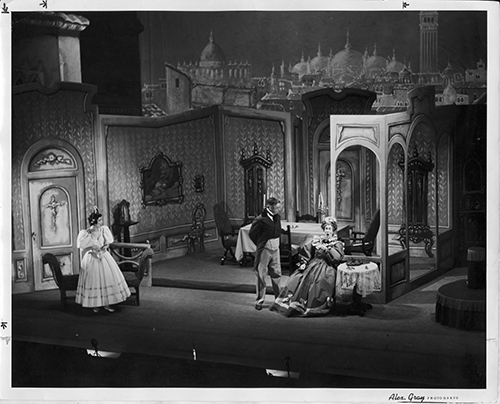 In 1949 MacMillan became Herman Geiger-Torel’s teaching assistant, and in 1950 joined the company as both a singer and assistant stage director. Over the years, MacMillan was a valuable member of the company’s artistic roster singing lead roles in La Bohème, The Consul, Die Fledermaus, The Magic Flute, and The Marriage of Figaro. 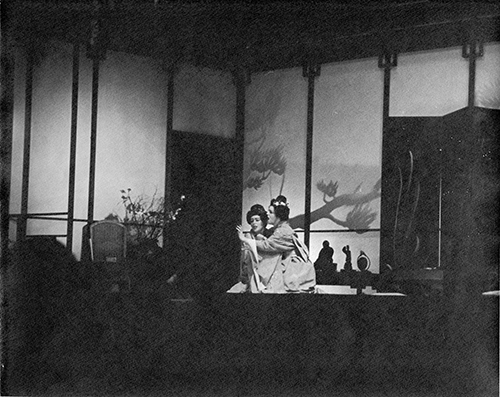 In addition, he directed Madama Butterfly in 1962, La Bohème in 1963 and 1965, and Die Fledermaus in 1964. Tenor James (Jimmie) Shields was already a well-known performer on radio and touring shows throughout the 1930s in Canada and the US, singing with the big bands of Morton Gould and Eddie Duchin, as well as appearing on the immensely popular radio shows hosted by Jack Benny, Fred Allen, and Fibber McGee and Molly. He also starred on his own weekly NBC program called Enna Jettick Melodies. From 1942-1946, he appeared as The Singing Sergeant-Major in the same Canadian Army Show as Andrew MacMillan. After the war, in addition to being a leading performer on CBC Opera, and appearing on stage at Massey Hall with the TSO and various other orchestras, he also sang for the COC. He was Rodolfo in La Bohème (1951 and 1954) and Pinkerton in Madama Butterfly (1951, 1953 and 1956). We remember them all with pride and gratitude. Thank you to the Joan Baillie Archives of the COC for the photographs and memories.